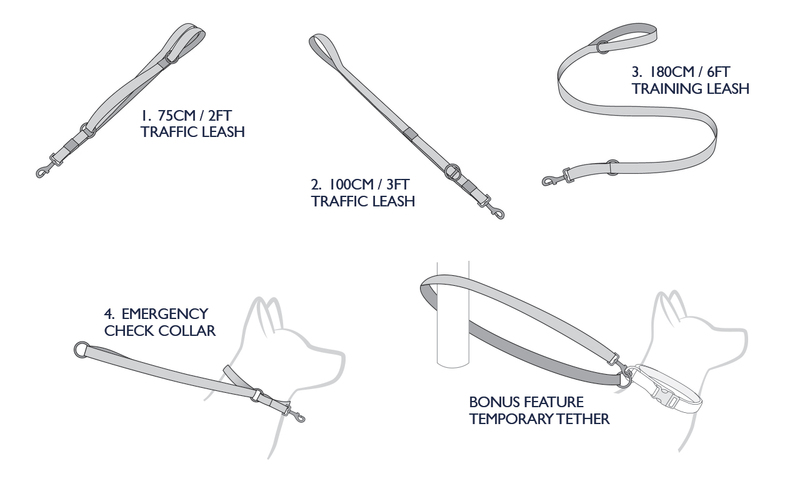 While walking you can go from a 185cm leash to a 100cm leash by pulling the leash through the D-ring at the collar end of the leash. Bring the handle back one more time and you now have a 72cm leash. You can then go back to a 185cm leash by just pulling on the D-ring. It's that easy! This Vario 4 LITE leash has been designed specifically for dogs under 12kg, with webbing and hardware that is smaller but still up to the same high quality that you expect from EzyDog. "This is my second Vario 4. I love the lightness of the clip so there is no pulling on my small dogs neck when clipped on and the adjustable length option. I choose this lead over other brands due to the feel of the led and quality. My reason for 4 stars not 5 is my older one felt slightly thinker and not as shinny. I have many Ezydog products because they are perfect for my dogs when we are out and about. Wishing my new lead was made the same as my older one."